Resistance bands, quite simply, are large elastic bands used for strength training. You can use a resistance band to add an extra level of challenge to any simple exercises you complete at home, allowing you to work your muscles while doing movements that would otherwise be too simple to give them an effective workout. 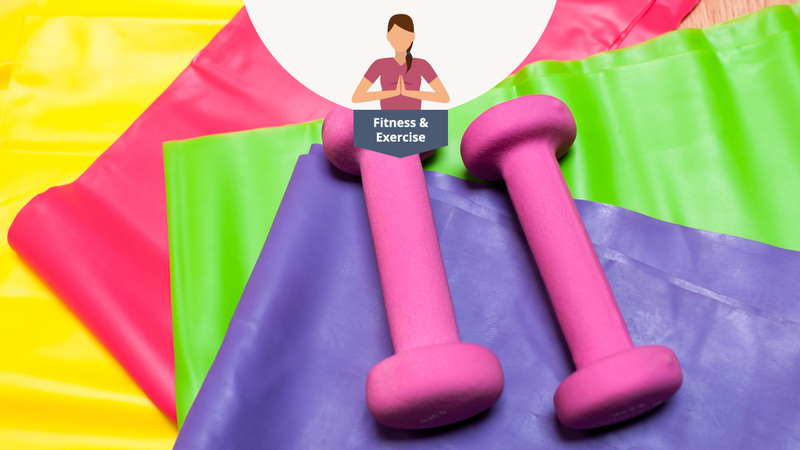 The bands can also be used in yoga and Pilates to help make the movements slightly more strenuous (although it’s not recommended you try this without the guidance of an instructor). If you haven’t used resistance bands before always start with the lightest resistance and only progress when you feel comfortable to do so. Just like any aerobic activity, resistance training can keep blood pressure at a healthy level and help you build strength. A resistance band is a good purchase for anyone who would like to work on toning their muscles, and the NHS lists working with resistance bands as an effective muscle-strengthening activity. They are generally a safer option than using free weights, as there is a risk that you might drop the weights and they may make unwanted contact with your stomach. Though light dumbbells (three to five pounds) shouldn’t pose too much of a problem, there is still some risk of drop accidents causing harm to your baby. Some pregnancy exercise classes may incorporate resistance bands into their routines, but it’s also likely that you’ll be intending to use your resistance band at home. Because you won’t be under the supervision of a trained instructor, it is all the more important that you seek medical guidance beforehand from your doctor or midwife. A pregnancy healthcare professional will ultimately be the ones to give you the go-ahead and let you know of any particular exercises or positions that need to be avoided. There a various types of resistance band to choose from: a simple straight band, a full loop, or a band with handles. They offer graded levels of resistance. The resistance level is often colour-coded (yellow is commonly associated with the lightest resistance while black bands tend to have the strongest), but this isn’t a completely reliable way of telling, as the colour-coding is not consistent across all manufacturers. Whenever you go to use a band, especially at the gym or at a class, check what level of resistance it is – light, medium, heavy, or x-heavy – on the band itself. During pregnancy, it’s best to stick with one that will only give you light resistance, especially if you are new to exercise. For the time being, it’s best to focus on maintaining and toning the muscles you have instead of trying to gain any more. Resistance bands are often sold in a set, which can include all the different resistance levels. It can be a good idea to buy a whole set, especially if you think you might like to carry on training after your baby is born because then you’ll be set up to continue your resistance band regime to keep yourself fit as you take on new motherhood. Here are some ideas of pregnancy-safe resistance band exercises to try. For each one, aim for about three sets consisting of 10 to 12 repetitions. You may choose to do the following without a resistance band and then bring in the band later once you are comfortable with the movements. Make sure you have plenty of space when doing resistance training especially when training at home, but avoid lifting and moving heavy objects such as coffee tables and sofas – get a training buddy or your partner to move furniture for you. This exercise helps work your hips. Place the resistance band around your ankles (best with a loop band) and separate your feet so the band becomes taut. Keep your feet parallel and knees bent. Step sideways, shuffling back and forth while keeping the band taut. This works your biceps and back muscles. It essentially emulates using a rowing machine. Sit with your back straight and your legs stretched out straight in front of you. Place the band around your feet and pull it taut. Pull the band back towards you, keeping your back straight. Lunges can be made more challenging with a resistance band, as you can use the band to add a bicep curl as you lunge forward, working both your lower and upper muscle groups. While holding each end of the resistance band, stand on the middle of the band with one foot and place the other behind you. There should be enough space between your front and back foot so that you can comfortably drop down into a lunge while standing. As you bend your knees to drop into the lunge position, pull the ends of the band up so you perform a bicep curl. Resistance band workouts can be fun and effective once you get the hang of them, but always remember to stay in tune with your body and take note of your own limitations. Always have a bottle of water handy so that you can take frequent sips when doing these exercises and make sure you follow all medical guidance given to you by healthcare professionals. 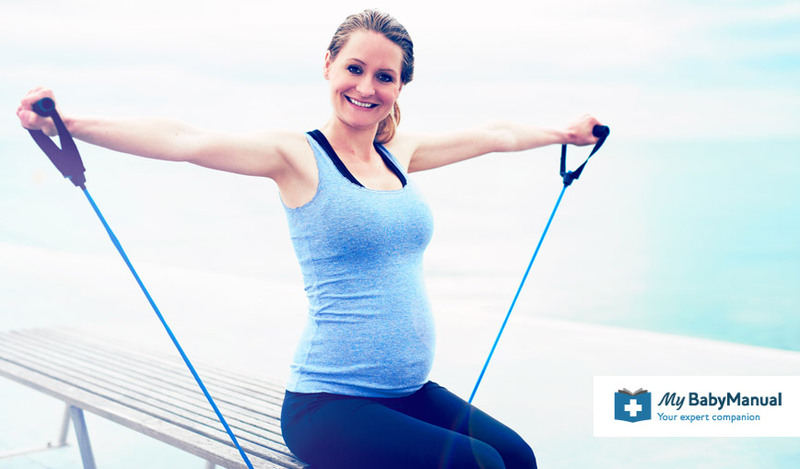 Resistance bands are a great addition to your pregnancy exercise regime. Quick and convenient, the exercises can easily fit into your daily routine, allowing you to build strength and endurance in preparation for when you finally go into labour.